I’m just an average man with an average life. It was confirmed this week that not only does the iPhone track your location, not only does it transmit that data to whatever computer it syncs with, but Apple has been gathering that data. 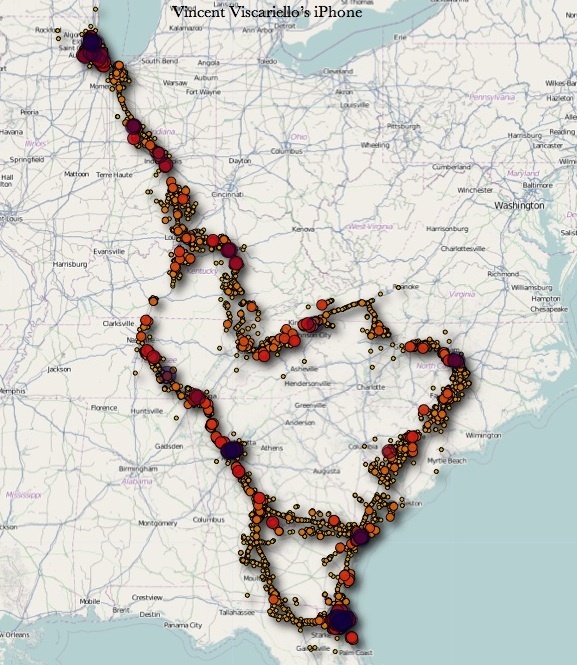 Pete Warden developed an open-source application that lets you look at that data yourself. It didn’t work on my MacBook, so I had to use a version that worked on a 32-bit Mac. The tracking is not entirely precise. It keeps track of cell towers and WiFi networks that your phone connected to, however briefly. For instance, during the time period in question, I didn’t go to Rockford or Belvedere (IL), or Wisconsin, or Alabama, or Asheville or Hendersonville (NC), or Columbia or Myrtle Beach or Charleston (SC). I don’t think I was in Roanoke, but that may have been part of a trip to Central Virginny, I’ll have to look up exactly when I was there. I was maybe 50 miles away from some of those locations. I didn’t know cell signals could go that far, but there you go. I looked at the data for this past Wednesday, the day I first downloaded the tracker. It was more than a little bit off. I was in two, maybe three locations that day: my house, school, and I might have stopped at Dad’s house after work. However, my cell signal was detected near the intersection of Hodges and Beach, in Ortega, on Townsend, on Heckscher, south of Green Cove Springs, south of Middleburg on Blanding, up in Cary (which is a few miles northwest of the 10 o’clock position of 295), at two locations in St. Augustine, in Gainesville, and at an airport near Lake City. That’s a scattershot list of locations, ranging from a few miles away to two hours away. Big Brother better go back to the drawing board. ← Back and to the left. I just wanted to say I have been thinking the same thing as Noutheteo since the “surprising” news came out.